Got my first Hinomitsuha in the 3P dungeon last night! Been chasing her since she debuted. Zela is a Rockstar. I love her! PSA: No SGF this weekend. wilk and Vaedriel like this. Patch 15.0 ROCKS!!! TY GH! Anyone know when the Rikuu Tourney rewards will arrive? They didn't make an announcement yet. What I remember is 10 days after the conclusion of the tournament, as the last few have been. So it should arrive on Wednesday. 6 Stamina for a mama tamadra is a heck of a deal! @Yani NP It's the weekend, you know what that means? Gold farming time! Had me a Bailey's Jameson coffee tonight. Let's see how I combo in the tourney now. Apparently, it worked, lol. I'm sitting at 18%. 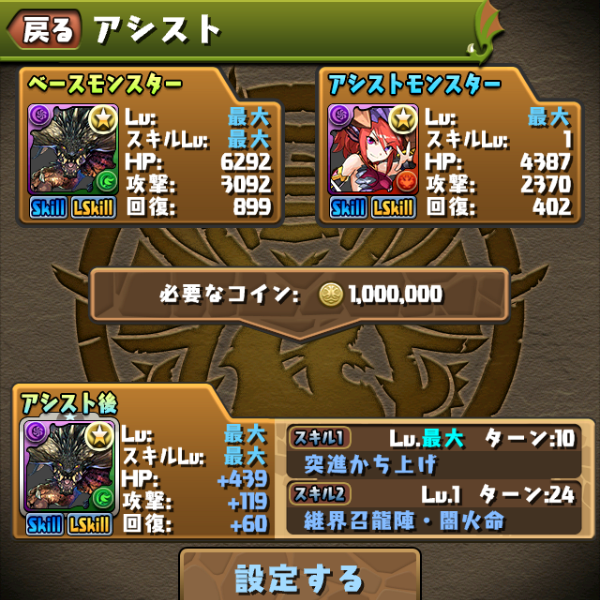 Yolo'd one of my REM unicorn cards last night: Vritra. Indian 1 set finally complete! Also got CB Horus on both accounts! wilk, Ultraduck, ko300zx and 1 other person like this. 3 Words: BEST. UPDATE. EVER. Piggy bank will be the bomb! I can finally 297 a few cards that are missing certain stats. OH Yeah! Kaede's new Evo ROCKS! Just finished a new piece of art! My muse is very pleased! I love the new Jin Twin evos! LF more Raijin friends on my Alt, Nemeriel! Can't wait for Kaede's evo too! Alt just pulled Yog and the Jin Twins in one pack! OMG!! So excited!! xer 21, kiarahakura and Marr like this. Who are these Jin Twins and what's their deal? SWEET! Thank you for checking into that! Without PADX updates I couldn't be sure. You're the best! Seems that is the deciding factor with MP shop cards and SI. I know DAthena can also be used as an assist and she also was originally a PAD Radar card. GF gave me a Cronus (new) and Typhon #2 out of 4 pulls. Not bad at all. Congrats! Typhon was my first 6* GFE, and I've got a ton of mileage out of him (and the second one I was thrilled to roll) from his UEvo to Anaphon to his new split UEvo which I keep in slot 1. I think this second one will become Annaphon. I did the new evo with the first one I got. Love the new art for him. Such a great card too. I'm on hiatus for a while. Need a break from PAD. Just don't forget your free roll Monday. And hope you have fun. Trying to see who to pair Ryune lead with. Which one are you getting? I have two Ryunes, so I did both evos. I put the 7c one on my BH team and the row one on my Meri team. Double SBR is good plus board is perfect for Meri. Been playing games since my first D&D box in 1984! Leads listed above. If you need one, message me IG or here.